Bistek Tagalog… What the heck is bistek tagalog you might be wandering? Thankfully I took about 11 years of Spanish, so I know a few things. Kidding aside, bistek, which translates simply to Beef Steak, and well, Tagalog (as I know it) refers to the Filipino language, one of which I know very little but I love participating and using those Spanish words to try to decipher that language but I always fail for the most part. So to me, bistek tagalog simply refers to Filipino beef steak. It is more than just beef steak though. 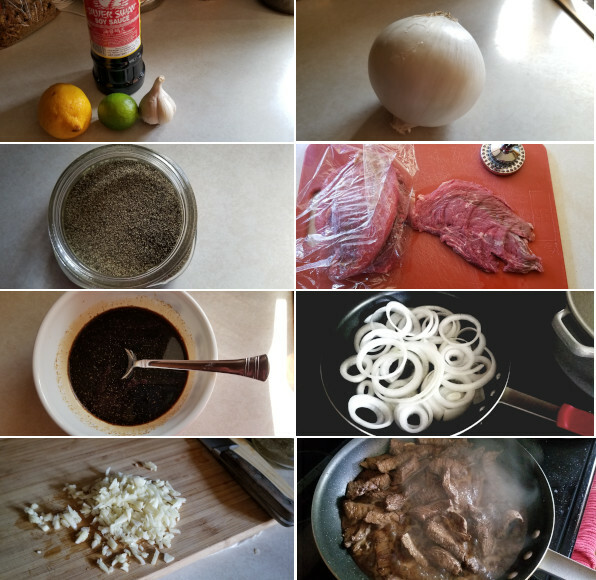 If you have been following any of my recipes over time, you will know that Filipino cuisine uses some common ingredients and a few of them being soy sauce, garlic, chilies, black pepper, and bay leaves, only to name a few. This particular dish is so darn simple to make, smells amazing, and delivers just a great bite of food that it may make it onto your lazy susan of weekly dishes to make! Let’s get started on this delicious recipe! There is one thing to take notice on the recipe and that is the beef selection. If you are wanting to elevate this dish, go with beef tenderloin, otherwise stick to top sirloin (lightly tenderize with meat mallet). Start, as always, by preparing all of your ingredients. Often times it is easier to freeze the meat slightly for easier slicing, and more control over the thickness of the meat. Keep that in mind. Once your beef, onions, and garlic are all set, then it is time to get to work. What I love about this is not only the flavor in this dish, but how quick it is to get it to the table. In a mixing bowl, add the soy sauce, lemon and lime juice, garlic, and black peppers. Add in the sliced beef and massage the meat getting that marinade really concentrated into the beef. You can let this marinate for hours if you want, but simply 10 minutes should work just fine. Set aside. Heat a very large skillet on medium-high heat. Add 2 tablespoons of the canola oil and let it come to a shimmer. Toss in the 3/4 of the onions, reduce the heat a bit, and cook for about 5 minutes. I like the onions to still have a bit of bite, so only a few minutes in the skillet, and you should be ready. You do not want to overcook these until they are limp, and definitely not fully raw. Remove the onions from the skillet and onto a plate, and set aside for later. Now, get the skillet back on the stove on medium-high heat. Add in the remaining 1 tablespoon of oil. With a slotted spoon, remove the beef and garlic from the bowl and into the skillet, reserving the marinade. Cook the beef for about 4 minutes, per side. Once cooked and a bit seared on each side, add in the marinade, along with any remaining garlic in there and bring to a simmer. Cover, reduce the heat, and cook for about 30 minutes. After 30 minutes, uncover, and top with the slightly cooked onions. Give this a good stir, and cook for about 5 more minutes. Now you are ready to plate. You can do this two ways. Serve individually (what fun is that?) or serve family style. I go family style. Pour the beef mixture into a large serving bowl and garnish with the remaining quarter of raw onions on the top, while adding the cooked jasmine rice to another serving bowl. Plate with rice, and top with the bistek tagalog. The flavors are out of this world. The tender beef along with those onions and garlic. Whoa, watch out people! 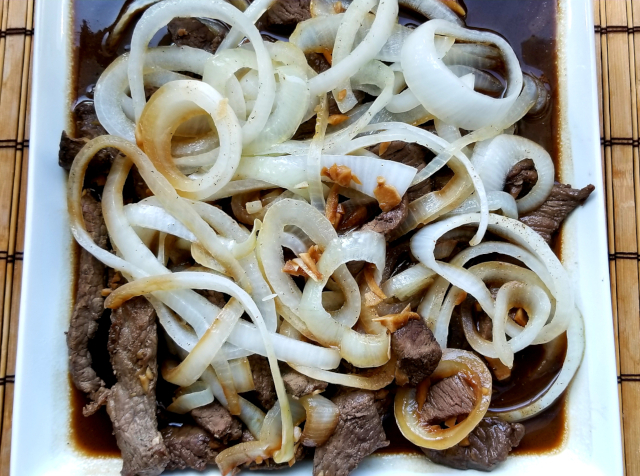 This is not only loaded with flavor, but the beef should be super tender, and the onions slightly crunch and pungent that just goes phenomenal with sweet, cooked jasmine rice. Enjoy! I made this tonight and it is fabulous! Jerry hasn’t tried it yet, he is still out in the field picking… Our norm for this time of year. I have no doubt he will love it! Such great flavors! Thanks for the tip on freezing the meat slightly before cutting it, worked great! We are at the West Allis market until the end of November… I hope we see you there! Paula, great to hear that you liked it, and hopefully Jerry got into it as well. It’s always great hearing from you, and hopefully I can get over to the market (I’ll plan on it) before the season is unfortunately over. I just roasted an acorn squash this morning for my wife. I split it, covered it in a bit of olive oil, maple syrup, and salt and pepper. Looked and smelled yummy! Hugs to both of you!